Pigeons can no longer be fed anywhere in central London's Trafalgar Square under a new byelaw. It has been illegal to feed birds in the main square since 2003, but protesters continued to feed pigeons and other birds on its north terrace. Westminster City Council has now secured a byelaw which extends the ban to that area, saying bird droppings create mess and spark complaints. Animal welfare groups said the new law would starve the flock to death. They called for a more humane approach and accused Westminster Council of scaremongering and untruths. Under the new law, anyone feeding birds in the north terrace risks a £500 fine. London Mayor Ken Livingstone originally imposed the ban to make the square "more pleasant for public use". But its north terrace did not fall under his jurisdiction, so people continued to throw seeds, bread, biscuits and corn to hundreds of birds in that area. Alan Bradley, Westminster City Council's cabinet member for street environment, said the authority did not want to harm the birds, but wanted to ensure the square was "a clean and welcoming place". Pointing to a flock of pigeons on the grass behind him, he said: "You see behind me? We've got a scene straight out of Hitchcock. "If someone dumps a bag of feed, as they do from time to time, that entire lot is going to fly up." Cllr Bradley said the issue was also one of hygiene. He said: "The pigeons, attracted by the food, leave a significant amount of droppings. "This is deeply unpleasant for the large number of visitors to the square as well as to the people who work nearby." Feeding pigeons also artificially increased the size of the flock to unsustainable levels, which would lead to poor health and deformity, Cllr Bradley said. 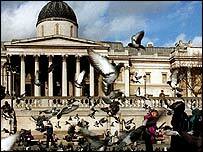 But the Save the Trafalgar Square Pigeons group strongly denied the claims. It insisted that a scheme introduced in 2002 to reduce birds in the area in a humane way, had reduced bird numbers by 75% - from 4,000 to 1,000. STTSP spokesman Niel Hansen said: "If we stop feeding overnight, all independent experts agree the remaining birds will starve. We will not tolerate that." The group said the best way to reduce pigeon numbers was in "a humane manner by gradually reducing their food supply".